Europe's new-car sales are slowing as incentive schemes start to run out. European new-car sales fell for the first time in 10 months in April as scrapping incentives that had been bolstering sales began to fade, and the economic situation remained difficult, industry association ACEA said. Governments throughout Europe launched scrapping schemes to help crisis-hit carmakers in the early part of last year, giving a boost to sales, but schemes have either finished or are being phased out. New-car registrations in Europe fell 6.9 percent to 1,171,044 units in April. The statistics include results from 25 of the 27 EU member states (data from Cyprus and Malta is not available) as well as sales numbers from Iceland, Norway and Switzerland. "In the first months of the present year ... government support has ended or begun to fade out and the economic situation remains difficult," ACEA said in a statement. Germany, whose scheme ended in September, posted the largest year-on-year decline in registrations, with a 31.7 percent drop. 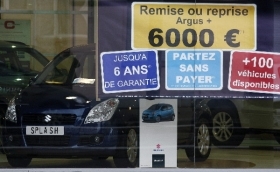 France, whose scrapping scheme is still in place, albeit at a reduced level, saw a 1.9 percent increase in registrations. In the first four months of the year, registrations in Europe were up 5.2 percent year-on-year to 4,941,153 units. ACEA's data showed that Japan's Nissan Motor Co. saw a 39.6 percent gain in registrations in April compared with the same month last year. Other gainers were Kia Motors Corp., whose registrations rose 9.6 percent, BMW AG, up 13.4 percent, and Renault SA, up 9.0 percent. Volkswagen AG, Europe's biggest carmaker, saw its group registrations slide 7.0 percent year-on-year in April, while Fiat S.p.A.'s group sales were down 26.9 percent and combined sales at Toyota Motor Corp. and its luxury Lexus brand were was down 18.9 percent last month.